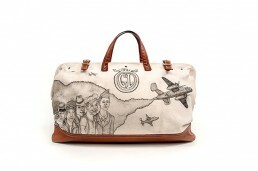 This bag was created for Paper Magazine as an homage to The Gentlemen’s League and all those who helped to create “The League.” The entire bag, illustrated by artist Adam Krueger, was created in the war time style from which the brand was concepted from and all the team’s portraits are drawn in professions commonly depicted in that era. On the front of the bag are the portraits all of the men who worked for The Gentlemen’s League. On the back are the portraits of the women team members, the hidden force behind The League. On the front there are war time planes saluting to victory. 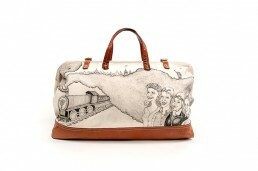 On the back, a train, the statue of liberty and the New York city skyline commemorating the American drive and the strive for freedom, truth and honor, Bag 032.